imo is also used in combination for all kinds of other potatoes. But in Northern Japan there are some areas where this plant is called "yama imo". In Kyushu, the word IMO came to indicate the sweet potato (Satsuma imo). dotare 土垂（どたれ）"hanging on the ground"
hasu imo 蓮芋（はすいも）"taro like lotus"
ZUIKI 随喜 can also mean "to weep with joy", and this name reminds us of a poem by the priest Muso Kokushi　夢窓国師 about this plant, hence the name. and more about Muso Kokushi ! kyooimo 京芋 "potatoes from Kyoto"
This is a specially tasty kind from Yamanashi prefecture. After Takeda Shingen had build a dam against the river, the earth, full of debris, was very suitable for vegetables which like water, but not wet feet. Some farmers in the 7th generation grow these special potatos, which even make their way to expensive restaurants in Kyoto. Varying with the root, the parent root or the child roots are eaten. Taro is a tropical plant grown primarily as a vegetable food for its edible corm, and secondarily as a leaf vegetable. It is considered a staple in oceanic cultures. It is believed to be one of the earliest cultivated plants. 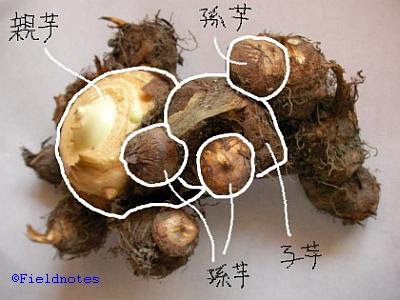 In its raw form the plant is toxic due to the presence of calcium oxalate, although the toxin is destroyed by cooking or can be removed by steeping taro roots in cold water overnight. Taro is closely related to Xanthosoma and Caladium, plants commonly grown as ornamentals, and like them it is sometimes loosely called elephant ear. The name "taro" is from Tahitian or other Polynesian languages; the plant is also called kalo (from Hawaiian), gabi in The Philippines, dalo in Fiji, seppankizhangu in Tamil, and Karkalo in Nepali. In Japan,it is called satoimo (サトイモ ,satoimo); kanji: 里芋; literally "sato potato". It is often simmered. The size and shape is like a brussels sprout. The child satoimo and grandchild satoimo are called imonoko (芋の子 ). Satoimo is believed to have been propagated from Southeast Asia in the late Jōmon period and it was one of the staple foods before rice became predominant. In the Philippines, taro is called gabi. Ishikawa is a small town near Osaka. They are round and about 4 cm in diameter and taste rather "umai". They are exported to many markets in West-Japan. They taste good when steamed with the skin, then peeled and sprinkled with salt. koimo, ko-imo 小芋 "small taro potato"
Especially used for dished during the full moon party time in Autumn, in Kyoto since the Heian period. There is also a sweet for the moon-viewing parties of the same name, so be careful not to mix it. They look like a bamboo shoot and have to be peeled like one to get to the delicious parts to eat. Also called Kyooimo, Kyoo imo 京いも. It has a longish form like a small crane. Used for Takamori Dengaku 高森田楽 dishes. They will help prevent a couple from fighting (fuufu kenka), because you have to watch the ingredients grilling on the other side of the open hearth (irori) to see that all is grilled equally ... and so peace in the family is kept. The name means a silk robe of a lady of the Heian period aristocracy. A special kind of potato (satoimo 里芋) is cooked with the peel (the "silk robe"), then the peel is taken off and the mash slightly salted. They are usually served for the tsukimi moon viewing parties in Autumn. Often made for the harvest festival and for the New Year celebrations. "simmered and rolled" taro, in soy sauce, mirin and dashi. This was the "taste of mother" (ofukuro no aji) until the advent of potatoes and "nikujaga" became more popular. yatsugashira やつがしら/ 八頭 "eight heads"
This is served as an auspicious food to people who are supposed to "lead others" (hito no ue ni tatsu), like a parent potato with many children potatoes around him. Served for the New Year. Dried zuiki was a food ration in castles of the Edo period, since it kept well and provided some vitamins. is a tuberous plant. It's a root crop. The tubers (roots) differ in color and size. A seize of about 30 cm long, is possible. The flesh inside is white. The taste of both leaves and tuber is acid. Cooking (with the skin removed) or baking takes this acid taste away. It is a native vegetable of India and parts of South-East Asia. The leaves are used in soups and stews, the cooked tuber is consumed as sweets, desserts or used in vegetable dishes. In the shape of taro roots. Taro roots (sato imo) were prepared as offerings, and moon-viewing doubled as a harvest festival. This became so widespread that the full moon in mid-fall also came to be known as imo meigetsu. imo meigetsu 芋名月 "Sweet Potato Full Moon"
Unable to go outside, Issa tries to see the night sky through a hole in the paper on the wood-frame and paper sliding door that stands closed between his room and the garden outside. The narrow, constricted view and his own inability to move seem by contrast to make the Milky Way even more beautiful and moving than when he could easily watch the whole sky. Taro leaves play an important part in the Star Festival, since the dew left on them in the morning is, according to legend, spilled on them during the night by the Milky Way. For this reason, people use dew collected from taro leaves to mix heaven-given ink and then write down their prayers to the star gods of the festival. In the first hokku above, however, Issa also seems to be thinking of the ancient homophony of the word for dew or water drop (tama) and the word for soul and life (tama). These meanings were commonly overlapped in Japanese poetry and prose, and Issa several times in hokku in this part of his diary uses tama to refer to the autumn dew outside, to his own life and soul, and to the soul of a haikai poet named Matsui, who belonged to the same Katsushika school of haikai to which Issa belonged when he was young. Matsui had died in the fifth month of 1813, so his soul was returning to its first O-Bon (Tama-matsuri) or Festival for Returning Souls in the middle of the seventh month, and Issa wrote several hokku that seem to refer to Matsui's soul as well as to his own mortality. The first hokku above is placed among these hokku. Taro leaves are very large and usually heart-shaped. Many of them are also deep in the center and suggest large green cups or bowls. 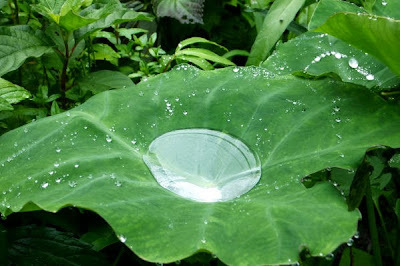 Issa says that one or more tama or drop of dew is on the leaf, and I take it to be mainly a single large drop, with most of the separate dewdrops having rolled downward and collected in the deepest part of the leaf. The image of a single large dewdrop much larger than normal also fits with the tenor of several hokku near this hokku in Issa's diary that suggest the importance of living on even though autumn is deepening. Issa might be thinking of his own life and soul (tama) as a gift from heaven, the Milky Way, and the universe and hoping it is large enough to allow him several more years of life in his hometown, to which he has just returned. Possibly Issa might also be thinking of a very large drop of dew as a healing counter-image to his large, pus-oozing boil. And several other readings suggest themselves. This vigorous hokku seems almost spherical in terms of its meanings. I had completely forgotten about our gabi, Gabi Z;>) Thanks so much for reminding of it. I'll probably eat it in a couple of months, when we visit. Of course, there are other veggies, some of which I actually miss more than our gabi -- kangkong, saluyot, ampalaya, to name some. Written in 元禄元年, Basho age 45. At temple Ooedera 大江寺 Oedera, Nabari town, Mie 名張市. The temple was surrounded by taro potato fields, but the weeds were much stronger. The rise of the moon.